When ecology graduate student Lindsay Miles visited Las Vegas a few years ago, she had a clear objective in mind. “I’m looking for the really gross, dirty alleyways,” she tells The Scientist. Scouring these alleys after dark, Miles—with a colleague accompanying her for safety—located thin, wispy webs tucked away in concrete nooks and crannies. With great care and a bowl-like scoop, she trapped western black widow spiders (Latrodectus hesperus) clinging to the silk, dropped them into a vial of 90 percent ethanol, and put them in the back of her Jeep Compass. Las Vegas was just one of the cities in the western United States that Miles visited in 2012 and 2013 on spider-collecting missions. Over a few months, she amassed more than 200 of the highly venomous but reclusive arachnids from these urban environments and from surrounding rural areas, and took them back to the lab of Brian Verrelli at Virginia Commonwealth University in Richmond to run genetic analyses. The black widow spider has recently expanded its range from rocky outcrops scattered in desert landscapes to crevices in modern cities. At the time of Miles’s project, ecological theory predicted that populations of animal species living in the city would likely have lower genetic diversity than those living in rural areas, because urban environments contain roads, buildings, and other physical barriers that can fragment species’ habitats and block dispersal, reducing the circulation of new genetic variants. Miles suspects that the differences between the genetic diversity levels of urban and rural populations were driven by genetic drift—the random accumulation or loss of genetic variants in a population—and the greater circulation of such variants by humans in cities than in the desert. Black widows are known to build their webs inside cars parked in urban areas, for example, so it’s possible that “when people drive around, they’re bringing these spiders with them,” she says. This would maintain gene flow among urban spiders while rural populations become isolated, and thus more genetically dissimilar from one another as they evolve in parallel. Miles’s results illustrate one of the many ways cities are having profound effects on their animal and plant residents. Globally, about 0.5 percent of Earth’s land area is urbanized, including 1.2 percent of North America and 2.3 percent of Europe, according to one 2015 analysis of satellite maps of nighttime light. As researchers are realizing that evolution can, and regularly does, happen at a much faster pace than previously thought—on the order of decades and centuries rather than millennia and eras—they are beginning to observe the effects of this global urbanization on species’ genetic makeup. Biologists now know that cities not only influence factors driving nonadaptive change, via such evolutionary processes as genetic drift and gene flow, but present a suite of special selection pressures for species living there, promoting adaptation too. The world is full of cities, and for many species, each city is an independent theater of evolution. The study of this so-called urban evolution “is an area that’s rapidly gaining momentum,” says Marc Johnson, an evolutionary ecologist at the University of Toronto who recently accepted Miles as a postdoc. He and a colleague reported in 2017 that the number of published studies on how species are evolving in the city had more than doubled in the preceding five years.2 Urban environments, he says, are seen by many as an exciting new playground for research into evolution in action. Matthew Combs, a graduate student in Jason Munshi-South’s lab at Fordham University, has spent the past five years exploring how urbanization drives nonadaptive genetic changes in New York City’s second most abundant mammal, the brown rat (Rattus norvegicus). Munshi-South’s group had previously found that urban populations of white-footed mice (Peromyscus leucopus) were geographically restricted to the city parks, and that mouse populations in different parks were genetically isolated from one another and much less genetically diverse than their rural counterparts.3 The researchers concluded that barriers to gene flow in the form of concrete buildings and roads separating parks are helping to shape these animals’ evolutionary futures. But Combs wondered what the picture would be like for a pest species such as R. norvegicus that, rather than being relegated to green areas, seems quite comfortable in the city’s concrete landscape. “There seems to be a soft migration barrier within the island of Manhattan,” says Combs. “Uptown and downtown areas are more residential and seem to be better habitat for rats,” whereas Midtown has less food waste and higher tourism and traffic, making the area less rat-friendly. Indeed, while Midtown is no stranger to the odd rodents passing through, it has relatively few resident rats. The uptown and downtown subpopulations that Combs identified were so well-defined that only one animal—Rat 126—bucked the trend, he notes. Found in a trap near uptown in Central Park, Rat 126 had downtown DNA; Combs guesses it was released into the park by someone who’d trapped it downtown but didn’t have the heart to kill it. Urban environments have the potential to influence the evolution of species in numerous ways. Some of these effects are nonadaptive, and are largely driven by changes in gene flow between populations. But others result from selection pressures that are unique to cities, such as greater nighttime illumination and more-extreme temperatures than rural areas. Whatever the dynamics of the effect, these results are helping to confirm that the structure of city environments has profound evolutionary implications for its inhabitants. “The specifics will vary from species to species,” says Luc De Meester, an evolutionary ecologist at the Katholieke Universiteit Leuven in Belgium. “But there are generalities.” While most research has focused on species of conservation concern, “even species that tend to be abundant . . . are very strongly impacted by city life,” he adds. From an evolutionary biologist’s point of view, this is a massive, unplanned experiment. Beyond provoking nonadaptive genetic evolution of the sort studied by Miles and Combs, urbanization presents a set of predictable environmental stressors that potentially act as strong selective pressures on specific parts of genomes—a phenomenon that researchers have only begun exploring in cities relatively recently. 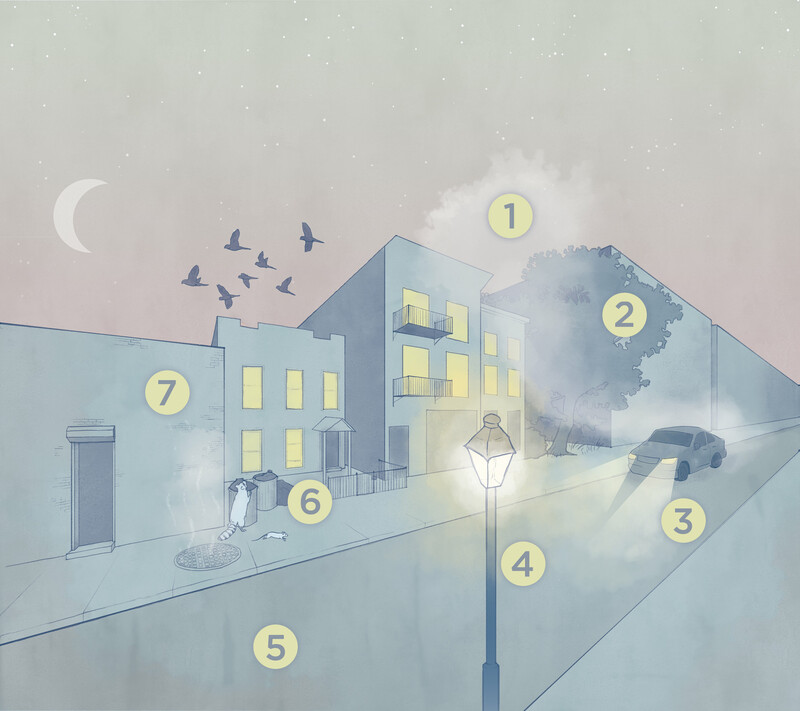 Increased light pollution may select for genotypes conferring lower light sensitivity, for example, while abundant food waste could select for particular metabolic traits. (See sidebar below.) And increased temperatures—the urban heat island effect—could select for higher heat tolerances. Case Western Reserve University evolutionary ecologists Sarah Diamond and Ryan Martin have explored the effects of urban heat on acorn ants (Temnothorax curvispinosus) living in and around Cleveland, Ohio. In 2017, the pair reported that urban ants were more heat tolerant and less cold tolerant than their rural counterparts—an effect that was present even when rural and urban populations were raised at the same temperature.11 The results of this so-called common garden experiment indicate that the differences are heritable, lending support to the idea that the city-dwelling insect populations had adapted to the warmer urban environment. To conclusively demonstrate that such traits are outcomes of natural selection, researchers need to understand the genotypes underlying apparently adaptive phenotypes. White clover (Trifolium repens), a small perennial plant, is a good model in this respect, says Johnson. Its ubiquity across most of North America reduces the impact of nonadaptive evolutionary processes such as genetic drift that can drive changes in smaller populations. And it possesses a well-described Mendelian trait that happens to be heat-sensitive: the production of hydrogen cyanide (HCN) in response to herbivory. HCN makes plant tissue particularly vulnerable to cold damage, so Johnson and then University of Toronto master’s candidate Ken Thompson hypothesized that populations adapting to urban heat islands, where temperatures are generally warmer, would have higher frequencies of HCN-producing plants than rural populations. The team subsequently showed that populations of clover along urban-rural transects had similar genetic diversity and high gene flow, indicating that the change in allele frequencies is likely the result of natural selection rather than genetic drift. That makes it a true example of urban adaptation—but to cold rather than to heat islands.15 Johnson has now launched the Global Urban Evolution (GLUE) project to study the plant species’ evolutionary responses across more than 180 cities worldwide. Compared to raccoons (Procyon lotor) in rural areas or in the city zoo, Toronto’s street raccoons are bulkier—some being almost a meter long and weighing up to 15 kilograms (33 pounds). Last summer, researchers documented signs of hyperglycemia in city populations of the nocturnal animals, a condition not observed in rural raccoons (Conserv Physiol, 6:coy026, 2018). The likely cause: a diet of high-fat, sugary food from the city’s garbage cans. Researchers have also reported diet changes in other urban mammals, birds, and even some invertebrates. A 2015 study found that Manhattan’s pavement ants (Tetramorium sp.) showed isotope signatures in their tissues consistent with increasing consumption of human fast foods (Proc R Soc B, 282:20142608). Researchers are now beginning to work out how these changes affect species in the long term. A recent study on house sparrows (Passer domesticus) suggests that urban living has led to strong positive selection at AMY2A, a gene that produces amylase and is associated with high-starch diets in humans and dogs (Proc R Soc B, 285:20181246, 2018). And Jason Munshi-South, an evolutionary biologist at Fordham University, and colleagues have identified signs of selection in white-footed mice (Peromyscus leucopus) at loci associated with lipid and carbohydrate metabolism—indicating that dietary adaptation may be occurring in urban populations of this species, too (Mol Ecol, 26:6336–50, 2017). How general is urban evolution? It’s a tricky question. For starters, it’s challenging to quantify how aptly cities serve as experimental replicates—particularly when researchers don’t fully understand which factors are most important in driving a particular urban species’ evolution. And the urban-rural divide often isn’t clear-cut, notes De Meester. Some cities are more developed than others, and many are making deliberate attempts to increase urban biodiversity via the construction of parks and other green areas. Even “rural” environments vary from pristine wild habitat to managed agricultural land. It will likely be several years before this research is expanded beyond single-species case studies, says Munshi-South, and longer before researchers can answer the question of whether urban evolution follows general principles. But the importance of understanding the mechanisms behind evolution in urban species already extends beyond evolutionary biology. Organisms living in cities are usually the most likely to come into contact with humans, so ways in which urbanization affects their evolution may indirectly influence human health.